Sun Salutation, also known by the Sanskrit name Surya Namaskar, is a dynamic series of Yoga postures. It is said that daily practice will give and help you maintain good health and prosperity. Traditionally hymns accompanied the flow of postures but in most western places this is not the case anymore. In ancient times, the belief was that all people were descendants of the sun. We all inherited a pure consciousness and daily salutations to the sun, was therefore an honouring of life. Surya Namaskar does not only work within the physical body but also the energetic subtle body and mind. Every move is connected to and guided by the breath. Traditionally the sequence of 12 postures is practiced with an empty stomach facing the direction of the rising sun. 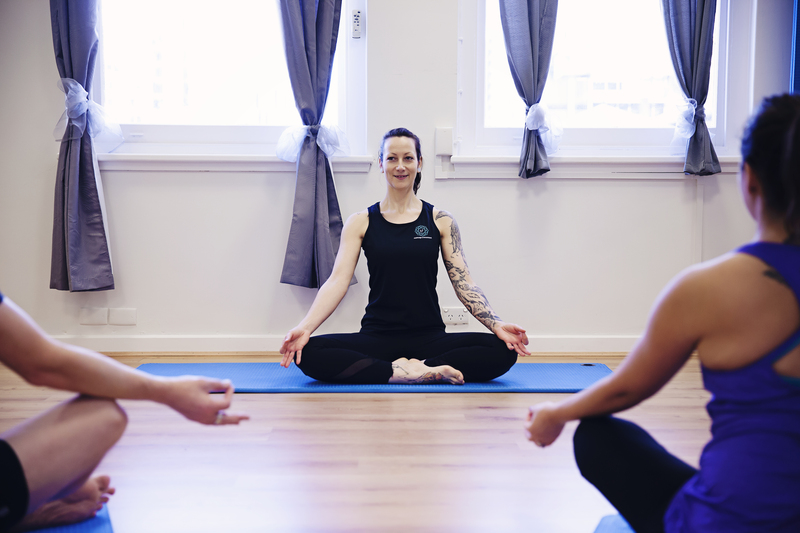 The first rounds should always be performed in an easy and gentle manner, to ease muscles and joints and the breath connection into the sequence. Start with a low number of repetitions and gradually increase up to 12 rounds. The sequence always starts and ends in Mountain Pose (Tadasana), which is a grounding and balancing pose. The breath guides the practice, i.e. ; the movement follows the length of the inhalation then exhalation. The exhalation is accompanied by forward bends and inhalations by back bends. The completion of Surya Namaskar is Corpse Pose (Savasana) which enables the body to receive all benefits. The counteracting postures throughout the sequence give the whole body a great stretch, regulate breathing, mobilize all joints (especially the spinal column) as well as stretch and strengthen muscles and connective tissues. Daily practice will bring lasting flexibility and mobility, combined with strength in muscles and bones. Internal organs are massaged, stretched, compressed and stimulated. Blood flow is increased, lungs emptied and supplied with additional oxygen, the circulation of blood in the spinal column is increased and the endocrine system stimulated. The vital energy is balanced and energy channels strengthened and the digestive fire strengthened on a physical and subtle level. Emotional conflict and the feeling of stress are reduced and a feeling of peace of mind restored. A morning practice will prepare body and mind for the oncoming day with strength and poise. Knowing the stimulating effects, there are a few conditions which contraindicate practicing Surya Namaskar to that extent. Please consult your health physician and Yoga teacher if you suffer from the following: fever, acute inflammation, knee conditions, intestinal diseases and loose stools, severe and acute back problems (e.g. disc issues), pregnancy, internal ulcers, coronary artery disease, other health conditions. Remember that it is very important to listen and acknowledge the body while practicing and use adaptations to avoid strain and receive maximum benefit. Straining the body to achieve ‘what the posture should look like’ will reduce the benefits gained and may end up in injury. If you have never practiced the sequence before or are not sure about some transformations, break up and practice specific transformations and postures before. A great position to practice before is Adho Mukha Svanasana (Downward Dog) and all its transitions. Beginners should start with two to three rounds to slowly prepare the body (take a rest in Extended Childs Pose in a class setting in case too many rounds put strain on the body), every few weeks this number can be increased until you easily practice 12 rounds. Breathe through the nose for the whole of the sequence. The practice will start in Mountain Pose (Tadasana) to ground body and mind and prepare for the practice. Stand at the front of the mat and close your eyes. Start off by bringing the big toes together, lift through the arches of the feet and bring heels closer together. Feel the lift of the arches; the knees are soft and gluts are soft; lift through pelvic floor, lower back and diaphragm; roll shoulder blades down feeding into the ribs without arching in the lower back; lift through throat and elongate through the crown of the head. Keeping the feeling of length up through the body and bring the awareness back to the feet. Are the feet evenly grounded between left and right foot and between back and front of feet; sway slightly from side to side and back and forth to establish an even ground. Slowly return to stillness and feel a deep grounding but also lightness in the extension of the body and bring your awareness to your breath. Open your eyes, press the palms of your hands together and bring the hands to heart centre. This posture is a preparation for the postures to come, very grounding and centring. With the inhalation raise the arms in a big circle above the head, lengthening up and lightly back. Keep the lower belly engaged to prevent the lower back from over arching. The whole front of the body stretches and the lungs expand to the sides. With the exhalation fold forward from the hip crease, planting the hands by the sides of the feet, bending the knees if needed. The strong lower belly will help to bend from the creases instead the lower back. The whole back of the body receives a good stretch and the forward fold helps the involuntary release of air out of the lungs. With the inhalation take a big step back with the right leg into a low lunge, untucking the toes and lengthening the upper body into a backbend. The weight is in the heel of the front foot and the top of the back foot presses into the mat. This posture gives a great stretch through the whole right front body, especially the right hip flexors. Exhale to step back with the left foot into a Downward Dog, with the feet aligned hip with apart and hands still shoulder width apart in position. The weight is in the knuckles of the thumbs, index fingers and middle fingers, the lower abdominals are still engaged and help stabilize the posture and prevent the hands from sliding forward. As with every forward fold, always bend from the hip crease, bend the knees to accommodate a straight back if needed. The front of the chest is kept inward and not popping out towards the floor. This is a beautiful lengthening posture for the back body but also very strengthening and invigorating. This posture retains the breath and is a transition into the next pose. From Downward Dog drop to your knees and bring the chin as close to the floor or touching the floor as you can whilst keeping the feet and hands in the same position as before. The heels and gluts are raised and lower belly still strong to protect the lower back. This position creates an arch in the feet and back. Initially the chest might not touch the floor but gradually over time it might come closer and will feel easier. This posture strengthens the arms and legs and stretches the upper back. With the inhalation sweep through leading with the nose and lengthening up, toes untucked into a cobra pose. The strong lower belly supports the lower back through this back bend and pushes the front of hips into the mat. Only lengthen up as much as feels comfortable as you don’t want to put strain on the lower back. (Keep the arms slightly bent for this posture.) Without letting the lower ribs pop to the front, the lungs are open and can receive as much air as possible, while the whole front of the body stretches. Exhale to tuck the toes under and push into the hands into a Downward Dog. The weight is in the knuckles of the thumbs, index fingers and middle fingers, the lower abdominals are still engaged and help stabilize the posture and prevent the hands from sliding forward. Bend from the hip crease, and bend the knees to accommodate a straight back if needed. The front of the chest is kept inward and not popping out towards the floor. 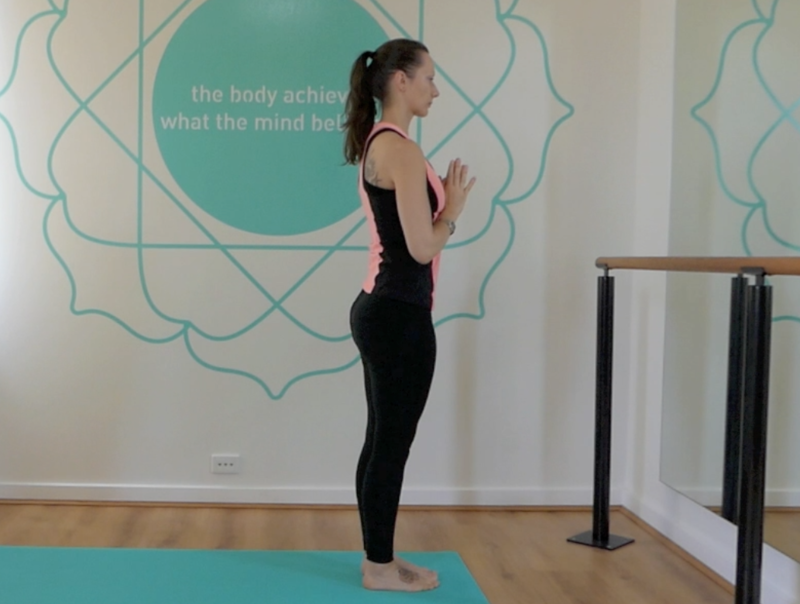 If the arms are not strong enough yet for an easy transition, come up to Downward Dog via extended Childs Pose (first push the hip towards the heels, then extend sit bones up towards ceiling). With the inhalation take a big step forward in a straight line with the right leg aiming for the space between the hands, into a low lunge. The weight is in the heel of the front foot and top of the back foot presses into the mat. Untucking the toes and lengthening the upper body. If the foot does not come as far forward, come to your fingers ( as shown in the photo opposite) to step forward and then grab the ankle with the right hand and assist the foot to its place between the hands and lengthen up. In case the step is too small to assist it forward, start walking forward with the inhalation and end up in Uttanasana (pose 10) with the exhalation. Eventually, with practice, this step will become easier. With the exhalation follow with your left foot into a forward fold, keeping the hands planted by the sides of the feet, bending the knees if needed. The strong lower belly will help to bend from the hip creases instead the lower back. The whole back of the body receives a good stretch and the forward fold helps the involuntary release of air out of the lungs. With the inhalation, raise the arms in a big circle above the head, lengthening up and slightly bend back. Keep the lower belly engaged to prevent the lower back from overarching. The whole front of the body stretches and the lungs expand to the sides. Exhale to bring the hands slowly down to heart centre. This closes this ½ round and is the preparation for the postures to come. To complete the round, repeat all steps but leading first with the left foot. After completing up to 12 rounds of Surya Namaskar, come into Savasana for a few minutes to receive all benefits of the practice. Lay long on your back, feet a little further than hip-width apart and completely relaxed, spine long and shoulders rolled down the back. Arms in line with the body and palms facing up, eyes closed and awareness to the breath. Realize the warmth you just created and the change of breath compared to the beginning of the practice. Notice the breath slowly return to normal and the muscles relax into the mat. Surya Namaskar generates energy and balances the body on a mental and physical plane. The sequence symbolizes the twenty-four hours of the day, twelve months of the year, rhythm of the universe and biorhythms of the body. It is said that with daily practice, mind and body rhythmically synchronize and generate energy for a full and dynamic life.